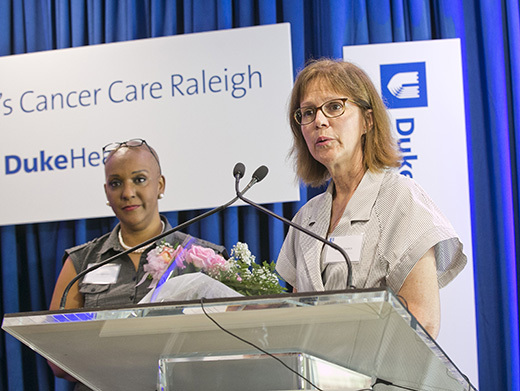 The Pretty In Pink Foundation, founded by Lisa Tolnitch, MD, Duke Women's Cancer Care Raleigh, will host its Pink Pumps and Bow Ties Dinner on Thursday, Oct. 26, from 5:30 to 9 p.m. at the Carolina Country Club in Raleigh, North Carolina. The event, presented by the Pretty In Pink Foundation's board of directors, will feature cocktails and honor Tolnitch, followed by dinner and dessert. Debra Morgan, anchor with WRAL, will emcee the event. The evening's event will also include host, Ira David Wood III, who will present the live auction. The Pretty In Pink Foundation provides uninsured and under-insured breast cancer patients in North Carolina with financial assistance for quality, life-saving medical treatment. Proceeds from Pink Pumps And Bow Ties benefit the foundation's mission. Duke Cancer Institute is a Gold Sponsor of this event. The Carolina Country Club is located at 2500 Glenwood Ave. in Raleigh. For more information or to register, visit Pink Pumps And Bow Ties.